Mint Leaves Recipes, Indian Vegetarian Pudina Recipes. Mint is the common name for the plant Mentha. The plant lives throughout the year and gives the bright green leaves. These mint leaves also called pudina, have a certain bright freshness about them which makes them extremely unique in taste. For the use in food, fresh mint leaves are preferred over the dried variety. They give a cool aftertaste as well and that’s why are used in many chewing gums as well as mouth fresheners. It is also used in various Ayurveda medication as it is said to be helpful in treating stomach aches and indigestion. If you want to know the Health Benefits of Mint Leaves, Pudina, click here. As everyone knows, the most basic recipe you find in India with mint leaves is the mint chutney! This condiment made with fresh mint with the addition of coriander, chillies and some nuts, is used as a dip for pakoras and bhajiyas and even as a spread in sandwiches! Not only does mint give a fresh taste to the food but also gives a bright green color to the food. Paneer Makhmali is a subzi that is wonderful to look at and eat! The aromatic subzi gets its color from the coriander and mint paste which complements the white of the paneer perfectly. Mint leaves, with other ingredients like paneer and green peas, makes for a wonderful filling in parathas. If you want, you can make Low Fat Paneer and Green peas Stuffed Parathas, which are diabetic friendly. The mint leaves ad a certain freshness and zing to the taste of the parathas. For other options there is the Minty Green Peas and Cabbage Parathas or an Onion and Mint Roti. Whether you call it Pani Puri or Golgappa or Puchka, no plate of this delight is complete without a spicy, minty water to tie the crispy puri, aloo filling and sweet chutney together! This snack is nothing without its teekha pudina pani, the perfect medley of flavors. There are endless varieties of snacks that can be served with a spicy pudina chutney, but there are many snacks that can be made with mint leaves as well. Pudina Aloo is a simple snack made by marination of boiled baby potatoes in a mint paste and served cold. Ragda Patties also use fresh mint leaves in the patties by stuffing it inside the mashed potatoes for a surprise element. The mint leaves provide a contrast to the hot ragda and crunchy onions and it all comes together very well. The delightful Suran Chana Dal Tikkis are crispy tikkis with different flavors that work well together: The coolness of the mint, the pungency of the garlic and onions and earthiness of the spice powders. The vegetable that goes really well with mint is peas. They complement each other so well that you can even make a healthy Green Peas and Mint Soup. Combine freshly picked mint leaves with curd and mustard powder for an excellent and easy salad dressing. This dressing can be poured over a Mixed Sprouts, Fruits and Veggie Salad, a very new way to eat all the healthy ingredients together! Puri bhaji is a staple in Indian households. Generally the puri is made with a simple whole wheat or maida dough, but you can definitely add a twist to it by making Phudina Puris. The dough is prepared by adding a mint and cumin puree in the flour itself which provides the green color and tingly taste to the puris. Let's skip to dessert now. Ice cream is one thing that has so many variations that it is not possible to find one that you don’t like. Mint Ice cream is cool, fresh ice cream that pairs well with a hot chocolate sauce. Once you start eating this, you will not go back to the other flavors! If you want to know more about the Uses of Mint leaves, Pudina then you can check out our article on that. 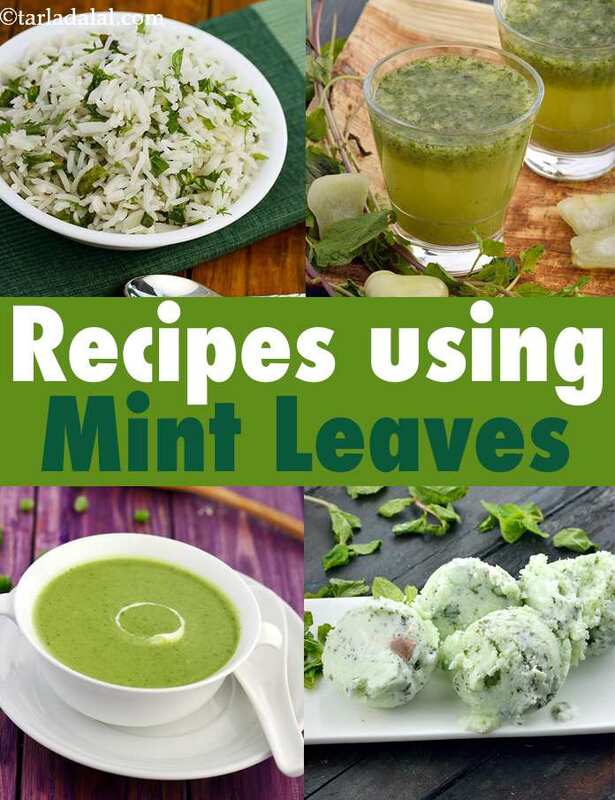 Hope you like this collection of Mint Leaves Recipes, Indian Pudina Recipes. Scroll down for more such recipes! Rice and vegetable flavoured with a spicy red chilli paste. A fiery feast.